Rolling Bins - Bins are convenient because they are mobile, make porting paper easy and allow users to perform purges and high volume clean outs. Flip open the top and dump-in entire boxes of material, then securely lock away with supplied padlock. 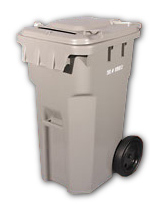 The industrial appearance of bins relegates their use to copier rooms and other back office areas. We offer rolling bins in two different sizes – a 64-gallon unit with a paper capacity of up to 250 pounds and a 95-gallon unit with a paper capacity of up to 337 pounds. Executive Consoles- We also offer attractive consoles for secure collection of smaller amounts of material. The small size of consoles allows for convenient hallway placement, while the "file cabinet look" and "computer grey" color keep public areas looking professional. You may place console in high traffic areas to facilitate visibility and use, but rest assured that materials are securely locked away until your next scheduled shredding service. Units are 40" tall by 19" square in dimension and are capable of holding 100 pounds of paper. We can also provide 27" tall units to squeeze under the work surface of modular workstations.